Trax Machines are a furniture item that used to allow users to play collections of songs from the different Trax Discs which could be put in the machine - e.g. Habbo Sounds. Most of the Trax Machines were released for version 12 and 13 during 2007, with a handful being released 2008 and a campaign-themed one for 'American Idol' being released on Habbo.com and Habbo.ca. Habbo.co.uk was originally the only hotel to have the Sound Machine Brown (and only in very small amounts), hence its existence on Habbo.com (International). 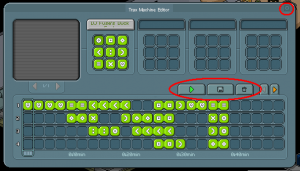 After the Habbo Beta update, Trax Machines could no longer be used and were kept un-tradeable, but due to the update of Groups on Habbo you could place them in group rooms. The only Trax Machines to never have been released on an English-speaking hotel prior to the merge (and afterwards) were the Grey Traxmachine and the Sound Machine Pro. Most of the Trax Machines have had their furniture names and descriptions removed, but existing tracks can still be played on them. Released when Habbo USA partnered with American Idol February 2009. First released in Finland March 2007. (Considered the "regular" trax machine). Given to everyone who signed up for one, USA and Canada, June 2007. You would register your email, get a code, enter it just like a credit code. On the UK Habbo, Eight winners received this machine, June 2007. First released in Norway (Hc Only) 2007. This machine was sold in the Scandinavian Habbo as the regular version. Aka: Ocean Traxmachine, given to two "DJ winners" on the USA Habbo, June 2007. First released on Habbo UK, June 2007. Was a prize in a Nokia competition, Singapore, June 2007. Also sold in valentines promotions. Gold, Silver, Bronze Traxmachine These machines were never released. However, their images still exist in Habbo's system. Traxmachine Nouvelle Star Part of a Habbo.es TV program promotion of February 2008. Trax are not used as frequenty as before, as the appeal has worn off and no new additions have been put into trax lately. With the April 2011 come-back of "trax", only Juke Boxes where updated to work again and songs made by Habbo where released for sale as an addition to past made discs. Note that you currently cannot make custom music as long ago. The interface for creating music on Trax's. This page was last edited on 26 July 2018, at 13:57.